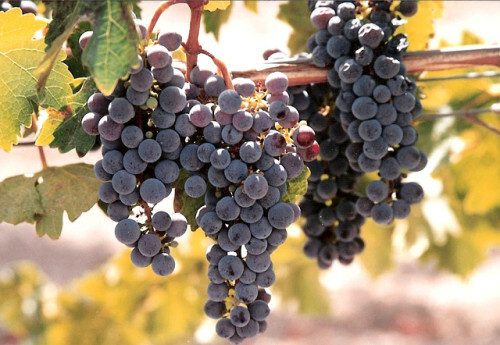 Though this red grape variety originated in Meditteranian Spain (500 B.C.) with the name Mataró, it is largely known for its French production as Mourvèdre. Meanwhile, the name Monastrell is lost in origin, but seems to work for all with easier pronounciation. Crazy enough, these are just three of over 95 names from around the world that label this red wine. Mataró thrives in hot climates with plenty of sunshine and no shortage of water. Clay soils have proven to be most suited to the grape as they retain water. Though it can be quite complicated to grow and typically requires the entire growing season to reach maturity, the sugar levels remain high, which results in higher alcohol levels. The grape and resulting wine can be compared easily to Cabernet Sauvignon and Shiraz with its chewy tannins and full body. Mataró, Mourvèdre and Monastrell are paired well with foods with lots of umami (savoury flavours tasted through glutamate receptors). We recommend beef short ribs, lamb, rabbit and pork shoulder for protein, lentils and mushrooms for veggie options. Lavander, rosemary and thyme work best for seasonning. WineCollective has featured many Mataró wines, and especially, GSM blends which have become popular in regions beyond Australia. You can find these listed wines perhaps in your cellar, at Highfield, and of course, the WineCollective online store! This is a rich and modern style red from Jumilla. Raspberry, plums and tart rhubarb with a bit of red licorice. The acidity is lower than moderate, the fruit is left weighty on the tongue. The tannins are sticky and well formed. The finish is accented with a savoury and cracked pepper. Primary aromas of fresh and sweet cherries with touches of strawberry and red currant. Very fruity characteristics overall. The fruit continues onto the palate with undertones of warm toast adding dimension and structure to the wine. It is well balanced and soft, with a fleshy finish. A great and easy drinking wine for any evening. Voluptuous plums and dry black fruits fill the mid palate. The wine is full bodied with soft tannins in the texture from the grape’s skins and spending 6 months in used French oak, which also gives some spice. A sweet and fruity finish lingers with a velvety smoothness. p.s. You can use the coupon code NEWSTORE10 for $10 off an online purchase. Or better yet, come visit the new store! Can you open wine with a pen?